Uneven, dull looking skin? The Aspect Dr Brightening Kit gives you the answer with proven botanical actives that really make a difference. Deep Clean is a purifying cleanser that contains a non irritating botanical retinoid and a blend of natural occurring AHAs which will exfoliate, renew and refine your skin enhancing your complexion. Improve skin pigmentation and prevent future pigmentation from developing. Helps lighten the appearance of age spots, freckles, hormonal marks and generally uneven skin tone. A superior patented lightening formula which may help to reduce the appearance of uneven skin tone. A concentrated vitamin A and AHA exfoliating complex which will help to refine and rebuild all skin types and treat all skin conditions. 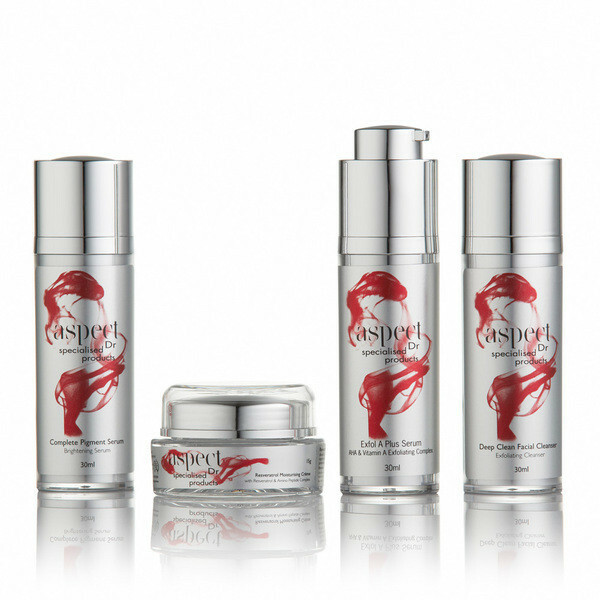 Resveratrol cream is a light weight moisturiser suitable for most skin types. A potent treatment moisturiser infused with Resveratrol, a strong antioxidant from grape skin, and Chronolinean Amino Peptide complex which work to help combat the visible signs of aging.